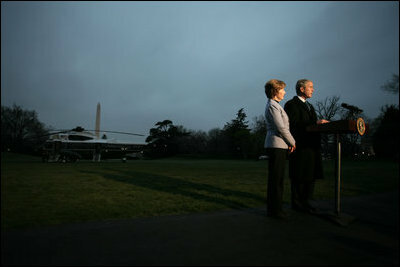 President George W. Bush, accompanied by Mrs. Laura Bush, talks to reporters before their departure to Ukraine Monday, March 31, 2008, on the South Lawn of the White House. President Bush urges Congress to pass the FISA reform bill and to act quickly to approve the Colombian Free Trade Agreement. President and Mrs. Laura Bush depart on a six-day trip to Ukraine, Romania, Croatia, and Russia. President Bush will have a scheduled meeting with Russian President Vladimir Putin.